Summer is in full swing, so if you haven’t already, it’s time to pull out those dusty, rusty grills, give them a scrub, and get ready for another BBQ season. As the resident Texan, I feel it my duty to write an informative piece on BBQ so you can all stand around the grill this summer and speak like true authorities on the subject. Firstly, let me just spend a minute to correct a key misconception. Grilling and barbecuing are not the same thing. Grilling is cooking something on a grill or open fire, with a direct heat source, with the lid open. Little to no smoke is involved in the process and it’s used for things that cook well over medium to high heats. Barbecuing is done with the lid closed, over a low, usually indirect heat, often involving smoking as part of the cooking method. It is used for larger cuts and joints that benefit from long cooking times and can handle the flavour of smoke. Both methods are great, but you need to pick the right one for right dish. 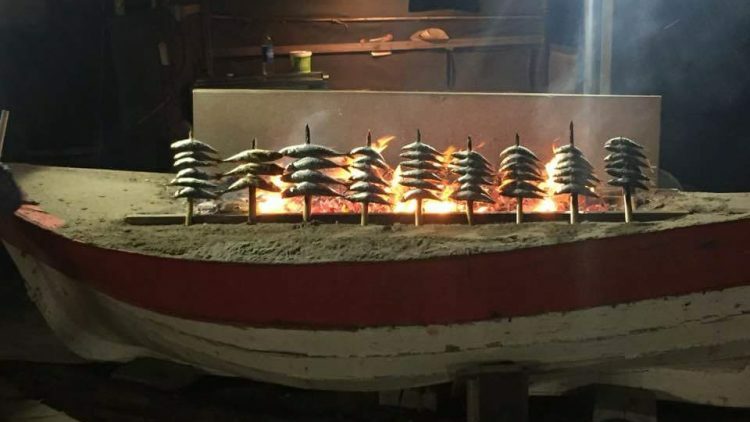 Whether grilling or barbecuing, there are a lot of different methods and you’ll see different methods in countries around the globe. In the Middle East they do a lot of grilled skewered meats, often marinated in lemon juice or yoghurt. In Southern Africa various wild game, kebabs, steaks and sausages are cooked over open flames in a method known as “braai”. The Jamaicans have their jerk chicken and fish. In Latin American, the Gauchos were the foundation of Churrasco, a method of cooking meat over open flames. Argentina has asado, or marinade-free meat cooked in a smokeless pit. In the Polynesian islands, whole pigs are wrapped in banana leaves and buried in the sand on a bed of smouldering coals and cooked for 12 to 24 hours. Indians have their tandoor style BBQ. In Asia, they are known for their satays, small skewers of meat cooked on fire, or Char Siu (pork roast), with meat skewered on long forks over open fires. Korean barbecue features thin slices of beef or pork cooked and served with rice. The Philippines have whole roast pig, called Lechong. There’s Mongolian barbecue, which is neither barbecue nor of Mongolian origin but rather a type of stir-fry recently invented in Taiwan. The Australians are masters of the good old grill, where they cook a phenomenal variety of meats and seafood. The Mediterranean is known for a wonderful array of grilled fish and meats as well. Many of these methods are more grilling than BBQ, and it is the introduction of smoke that really created what we know today. Smokehouses have been used all over the world for thousands of years. It began as a preservation technique, some believe, dating back as far as the cavemen, who may have originally used smoke to keep flies off meat as they dried it, only to discover this also preserved meat. Hot smoking and cold smoking have evolved into huge movements in their own right, but that’s for another day. People now smoke their meats on a variety of different woods to impart different flavours to the finished dishes. It’s when you combine the grill and the smoke that you get what I would call true BBQ, also called smoke roasting, and this is the type of BBQ that you’ll recognise as the dominant form from the US. 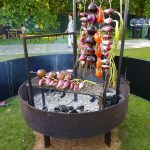 The word barbecue comes from the Taino Indian word barbacoa “framework or sticks”, which the Caribbean Indians gave to a wooden rack on which they stored things and cooked meats. The Spaniards quickly adopted the word and their method of grilling meats over open fire. Yes, we can thank Christopher Columbus for discovering this method from the indigenous Indian tribes and bringing it up to the southern colonies of the US. It then took a fascinating turn as it hit the colonies and became influenced by colonial immigrants. Pork at that time did, and still does, dominate the US BBQ menu. That is because the southern colonies relied on cheap, free range pig farming, as they did not have the open land and plentiful feed for cows. 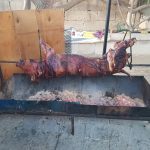 These free range pigs could thrive in forest areas and were much leaner than the pigs we have become accustomed to now, so they required low and slow cooking to tenderise the meat. As corn and maize were the most plentiful crop, the natural accompaniment to BBQ became cornbread. Adding sauce to BBQ as it cooks can be attributed to the British colonists who were already accustomed to basting meats to maintain moisture. They had a fondness for tart sauces, so this evolved into the vinegar based sauces you find in North Carolina. In Southern Carolina, the French and German immigrants introduced mustard to their sauces, instead of vinegar, and the Germans can be given credit for the introduction of sausages to the menu. As we moved West the open land was ideal for cultivating cattle and sheep, so Kansas and Kentucky started introducing beef and mutton to the menu. By the time it got to Texas, with their huge cattle raising culture, beef was king. Memphis benefited from expanded trade on the Mississippi river, gaining access to new products, thus the introduction of molasses and the sweeter Memphis style of BBQ sauce. We are now left with what is called the BBQ belt, which extends from Virginia and the Carolinas to Texas. 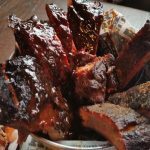 It is widely accepted that there are 4 main BBQ styles, represented by Carolina, Texas, Memphis and Kansas City, but there are 14 core BBQ states, and each one has a different style that they will fiercely defend as the best in the world. Yes, there are states outside of the belt, but it is worth noting that the belt contains 70 of the top 100 BBQ restaurants and those outside of belt still have their origins from the south. I was raised with Texas BBQ. That focuses on brisket as the core meat, followed by beef ribs. The German immigrants played a part in Texas as well, so we also had sausages. The Texans only BBQ over mesquite or oak, because that’s what grows there. There are 4 main styles in Texas. Barbecue in East Texas employs pork as often as beef, usually chopped and served on a bun with thin, tomato-based hot sauce. In Central Texas, brisket is typically served on its own. South Texas barbecue is heavily influenced by Mexican flavours and traditions: barbacoa de cabeza, whereby a cow’s head is wrapped in maguey leaves and buried in a pit with hot coal. This is a regional favourite. West Texas, where I’m from, is home to “cowboy-style” barbecue, where meat was originally cooked over an open pit of mesquite wood, with liberal use of dry rubs, rarely accompanied by sauces. Nowadays, we tend to use barrel smokers and fire pits in the truly authentic BBQ joints. I myself am a big fan of the Big Green Egg, which can grill, smoke and even act as a pizza oven. So now that I’ve told you all this, I want you to ignore it all. Yes, it’s great to be able to speak from a position of knowledge and to understand the history, but I think purists that think you can only ever do something the way it has always traditionally been done stand completely in the way of innovation and improvements. Of course, if you want something to be authentic, then use the traditional, but when you’re finding your own favourite recipes, adapt it to what you like best. For instance, my favourite two things in the world are beef ribs and brisket. Being a Texan, I’m living up to my traditional upbringing with my beef preference. However, I like tangy, thick sauces. When I do my 12 hour, slow smoked ribs or brisket, I serve them with a homemade bbq sauce that would have my Texan forefathers turning in their graves, but I love it and my guests usually do too. So learn the basics first, and you will have a good grounding in what works best for different meats, then experiment and have fun finding your own perfect recipes. As Picasso said, “Learn the rules like a pro, so you can break them like an artist”.